On a quiet street in the sort of empty area in Chinatown sits a tiny restaurant, Cheeky Sandwiches. Definitely one of those places you’ll miss if you blink. The space is small and the door to get in is smaller but the owner is all heart. He’s super friendly and makes one of the best fried chicken sandwiches in town. This is one of those places I regret not going sooner. 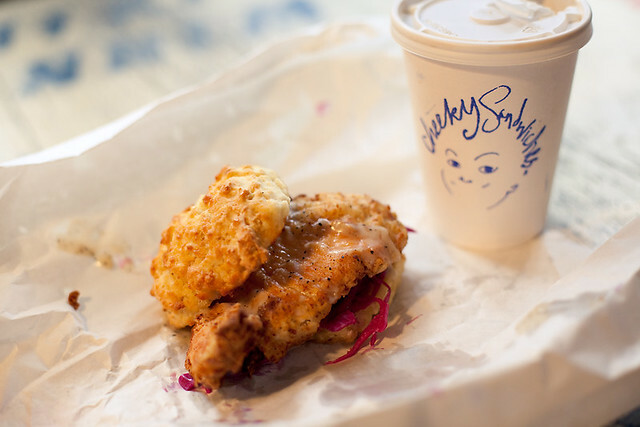 Delicious fried chicken on a bed of slaw topped with gravy and between a biscuit. What better combo?